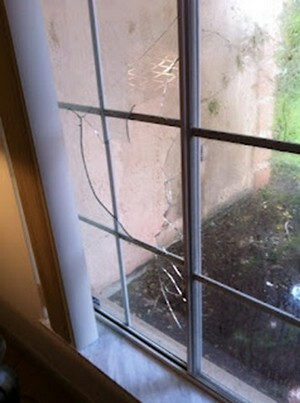 See the broken glass? A robber did that. He broke in and stole from one of God’s ministries, Surrender40. Five robberies have occurred in sixty days in the area, including the Pentecostal church down the street from Surrender40. Not only did the perpetrator rob ministries but he also robbed the ministries’ recipients, like himself, of what God’s workers could have done for them. 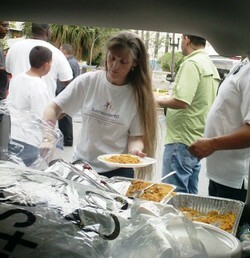 Trachena and Steve Muchnick run a wonderful ministry to the homeless in drug-infested Miami. At the time of the robbery, Trachena was in the building and able to hide in the bathroom and escaped harm, thanks to God’s mighty hand of protection. Through the ministry, they give out meals, shirts, socks, sweaters, blankets, jackets, Bibles, hygiene items, and many other items, feeding over 200 people every two weeks and preaching the Gospel to them. They also minister to the inmates in the Florida prisons and visit the sick and suffering in local area hospitals. Devotionals are written on a weekly basis and sent out to over 100 women, a large majority of them are incarcerated for life. 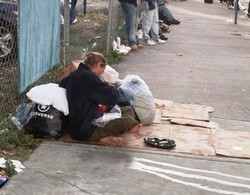 The city of Miami recently outlawed all homeless feeding ministries. Anyone violating the ordinance will be arrested and fined $300 for each occurrence. Because of this, Trachena and Steve planned to move north within 30-60 days. It has also been their dream to open a homeless shelter for those who desire to get off the streets and a transitional shelter for inmates coming out of prison. Unfortunately, their dreams are smashed. In less then four minutes of ransacking and burglarizing, everything is gone. Now, they must start all over again at the bottom. Their financial coffer is empty. Never defeated, they keep their coffer of faith full. They know God will restore and replace what the enemy stole from them. The culprit who did this was arrested days later and is now in jail, facing a life sentence for being a career criminal. At the moment, he is in one of the jails in which the Muchnicks have preached. If you feel so led, please pray for him. His name is Kevin. I’ve never asked my readers to support a specific ministry, so I hope you will not mind. I believe strongly in Trachena and Steven’s work. They are now turning to others to ask for donations to get to the $10,000 mark that they need to move the entire ministry. Would you prayerfully consider donating to their cause? If you feel so led, you can donate on their website through PayPal or you can send a check to the address listed on their website. As everyone’s finances are strained in these times, if you are not able to help financially, would you please pray for them? Anything you can do would be greatly appreciated. May the Lord bless you! Lynn, This is what we posted on our Facebook page, and thank you SO MUCH, you are so gifted and talented and we are so grateful! One of Surrender40 Ministries greatest friends and supporters, Lynn Mosher, wrote an incredibly touching and beautiful article about us on her blog. Please read this and feel free to comment! Thank you Lynn and God Bless! Thanks so much Lynn..you are such a blessing to us!! Your writings always amaze me and I know that come from God. You are truly blessed. So happy to do it for you! Hope it helps! And I’m so sorry that I forgot about Pink Love. Forgive me! Such a shame. Lovely way to post about a need, Lynn. Thanks so much for taking time to read about them, Carol! I appreciate it. Bless you! I can’t do anything except pray, but I am very happy to do that. May God inspire those who have extra funds to share them for good causes like this one. Amen. Ceci, your precious prayers are greatly appreciated! Thank you, sweetie! Bless you! Wow! Thanks so much, CBM! I deeply appreciate your kind words. Bless you! Welcome to my little cubby hole on the internet. So glad to have you visit! My door is always open. Make yourself at home. ...writing to encourage others on their journey Home!